The weather has turned cold here in New Hampshire, and with the fall season comes the annual lighting of the pilot in our gas fireplace. My house suddenly shrinks from several rooms to just a couple as we feel the pull of warmth and light. It has me thinking of the miner’s in Chile, recently rescued, living in a tight space for 69 days and nights, hoping for daylight and loved ones faces. I write about fictitious heroes daily, but the men who survived the San Jose mine accident are each and every one heroes, heroes to each other, to their families, their countrymen, and much of the world. 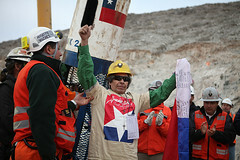 Hopefully their struggle will enlighten the government of Chile to workers safety. When I create characters, I pull them out of my imagination, or they are someone I see at a bus stop, or at the park. Often, they are an amalgam of people I have met or read about over the span of my life. I am pretty sure many writers work this way. In my wondering mode, by my fireplace, I wonder how many writers’ imaginations will be sparked by these 33 miners from Chile, and where will we see these heroes pop up? Ps There is another hero I am thinking about and he is also in a tight, dark place, hoping for daylight and loved ones faces. Liu Xiaobo, recent Nobel Peace Prize winner, is in a jail cell in China, serving his 4th prison sentence for inciting subversion of state power. This entry was posted in general and tagged Chile, China, creative writing, heroes, Liu Xiaobo, miners, New Hampshire, Nobel Peace Prize, San Jose. Bookmark the permalink. Sally, dude, YOU are my hero. Excellent job. love the title and its double, no it could be triple effect with a little bit of spices. Good post. The miners survival story is certainly inspirational.